When you have a firewall active on your Windows 10 laptop, you can allow certain programs to communicate through that firewall. For example, you might want to allow live apps such as Weather or Video to send information or content to your computer. 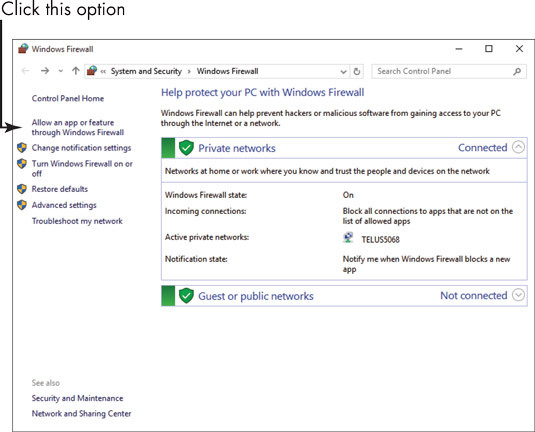 In the Start menu click Settings, and then enter Firewall in the Find a Setting search box. Click Windows Firewall in the search results. 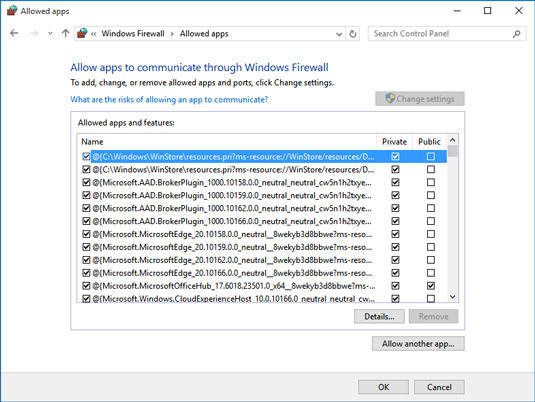 In the resulting Windows Firewall window, click Allow an App or Feature through Windows Firewall. In the Allowed Apps window that appears, click the Change Settings button, and then select the check box for apps on your computer that you want to allow to communicate over the Internet without being stopped by Firewall. Click the Private and Public check box to narrow down whether you want just networks that are secure to allow this communication, or also public and nonsecure networks to do so. Click OK and then click the Close button to close the Windows Firewall window. If you allow apps to communicate across your firewall, it’s very important that you do have antivirus and antispyware software installed on your laptop, and that you run updates to them on a regular basis. These types of programs help you avoid downloading malware to your laptop that could cause advertising pop-ups, slow your laptop’s performance, damage computer files, or even track your keystrokes as you type to steal your identity and more. If you don’t want to pay for such a program, consider a free solution such as Spyware Terminator.